Newsstand is the new app from Apple for iPhone, iPod touch and iPad that incorporates subscribing to and reading magazines and newspapers all in one place. With the release of iOS 5, Newsstand will give readers an easy way to get their favorite news publications from the App Store that are readable in Newsstand on the iPhone and iPad. Newsstand look like and works in conjuction with the iBooks app which already serves as the Store and reader app for eBooks on the iOS platform. Subscribe to any publication and new issues are delivered to your Newsstand application automatically. You will also get notifications when the new issues are ready for you. Open the App Store and search for your favorite newspapers and magazines, where you can buy and read, or subscribe instantly. Search for content by title and view and rate as well. Until now Magazine and Newspapers have been supported by a variety of publishers, most notably the Zinio app for magazine publications and the PressReader app for newspaper subscriptions. A variety of other magazines also have their own iPad and iPhone apps like the Wired magazine app and creating the LA Times apps for iPhone and iPad. 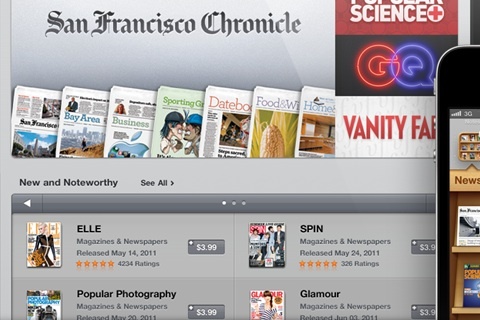 It will be interesting to see how Newsstand will affect these other apps. There is no word yet on the pricing and subscription fees that publishers are going to charge for magazines and newspapers in the Newsstand app. If you take a look at the screenshot from Apple it does contain some pricing information, which may or may not be accurate. For example you’ll see issues of Elle, Spin, Glamour, and Popular Photography sell for $3.99 each. 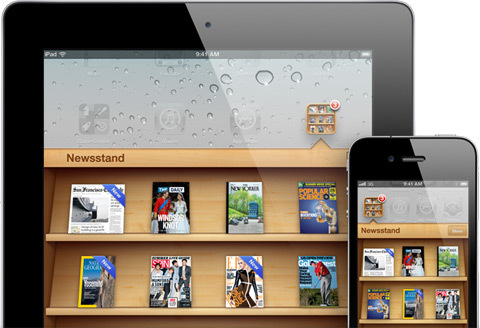 Newsstand will be a universal binary app and will work on the iPod touch, iPhone and iPad. AppSafari review of Newsstand was written by Joe Seifi on June 6th, 2011 and categorized under Coming Soon, Free, iPad apps, News, Reading, Universal. Page viewed 6794 times, 2 so far today. Need help on using these apps? Please read the Help Page. I can’t get on it as yahoo has hijacked it yahoo aps covers the page and can’t get to anything else on the page what a crock !